Finally. 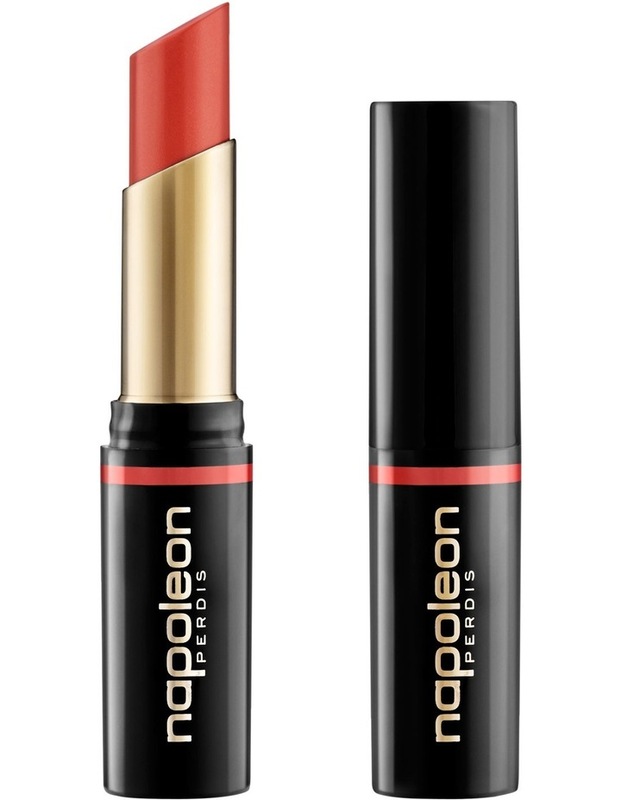 The matte lipstick that Napoleon has been waiting for. Packaged in high-glam slim-line black bullets, this new collection earns its name for its high comfort, long-lasting wear with a modern matte finish. It comes in six intense shades named for Hollywood's most glamorous screen stars: Marlene Dietrich, Ava Gardner, Lana Turner, Veronica Lake, Lauren Bacall, and Rita Hayworth. THE BEST BIT! HydraTechnology provides long-lasting, intense hydration for a pout that will take you from your desk to the dance floor! Sodium Hyaluronate keeps lips soft, smooth & hydrated, squalane provides antioxidant protection and keeps lips hydrated, vitamin E retains moisture and promotes suppleness so lips won't dry out as they do with some long-wear lipsticks, suspended pigments allow an even and intense colour application. PRO TIPS: Try Mattetastic on the cheeks as a gorgeous cream blush! Mix any of these lipsticks with Luminous Lip Veil, DVine Goddess Lipsticks or layer with a Lip Pencil to customise the colour. INGREDIENTS: HYDROGENATED POLYISOBUTENE, DIMETHICONE, ALUMINUM STARCH OCTENYLSUCCINATE, POLYETHYLENE, POLYBUTENE, OCTYLDODECANOL, MICROCRYSTALLINE WAX (CERA MICROCRISTALLINA), KAOLIN, EUPHORBIA CERIFERA (CANDELILLA) WAX, DISTEARDIMONIUM HECTORITE, HYDROGENATED CASTOR OIL, HELIANTHUS ANNUUS (SUNFLOWER) SEED OIL UNSAPONIFIABLES, TOCOPHERYL ACETATE, TOCOPHEROL, ASCORBYL PALMITATE, OCTYLDODECYL NEOPENTANOATE, HYDROGENATED POLYCYCLOPENTADIENE, SQUALANE, ALUMINUM HYDROXIDE, ISOPROPYL TITANIUM TRIISOSTEARATE, SODIUM LAUROYL ASPARTATE, ZINC CHLORIDE, PROPYLENE CARBONATE, SODIUM HYALURONATE, CAPRYLYL GLYCOL. MAY CONTAIN: MICA, TITANIUM DIOXIDE (CI 77891), IRON OXIDES (CI 77491, CI 77492, CI 77499), CARMINE (CI 75470), RED 6 (CI 15850), RED 7 LAKE (CI 15850), RED 21 (CI 45380), RED 27 (CI 45410), RED 28 LAKE (CI 45410), RED 33 LAKE (CI 17200), YELLOW 5 LAKE (CI 19140), YELLOW 6 LAKE (CI 15985).